From the Hancock County Courthouse, go east on Hwy 16 for 7.9 miles. Turn right on a dirt hunting road. Drive or walk 0.6 mile (the power lines will be about 100 yards in front of you). The cemetery is on your right 50 yards from the road and cannot be seen from the road. There is only one remaining marked grave in this cemetery. 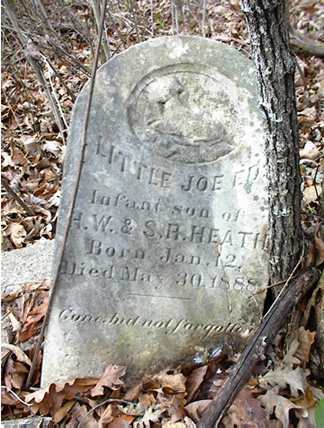 Infant s/o H. W. and S. R. Heath.